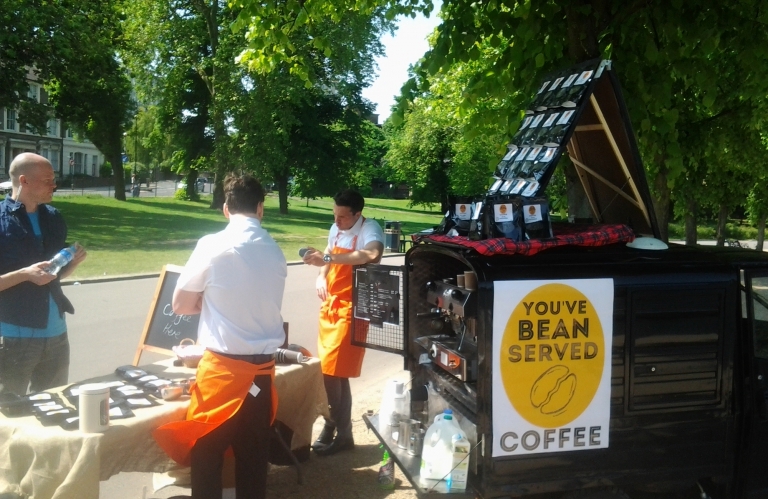 With Cafe Santiago you can hire our mobile coffee van, trike or bar to provide you with a fresh ground coffee service on your TV or film set. Whether you are shooting in a studio or out on location our mobile coffee units provide the perfect solution to bring you caffeine when you need it. To compliment the fresh ground barista coffee we offer a variety of fresh leaf teas, great hot chocolate and seasonal options like Iced lattes! If there is is something not listed just ask and we will do our best to provide it. Seasonal options such as fruit smoothies or winter mulled wine are available. If space is limited but power is available we have our little mobile coffee bar which can squeeze into the tightest of spaces and still deliver all the barista style hot drinks that your cast and crew love. So please feel free to give us a call - 07984184902 or drop us an email and we can discuss how we can help on your next production.